Finish Rooms Quickly With Mohawk Artfully Done Carpet Tile | Floors, Flooring, Carpet and More! When Mrs. Dixon had called us she had explained that they were on a tight schedule for the installation, with professional installation not available to schedule for a few weeks out, plus the possible pet stains” the simple and easy to install Mohawk Artfully Done carpet tile was a great alternative. 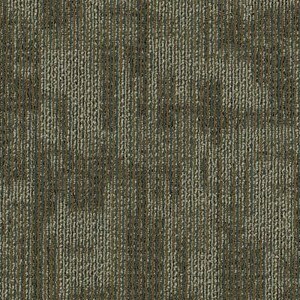 Mohawk Artfully Done carpet tile is perfect for any room in your home or business. This tile can be found as flooring in basements, in living rooms, in family rooms, as bedroom flooring, in dining rooms, as flooring for churches, in home offices and much more. The Mohawk Artfully Done carpet tile are 24×24 inch in size and come with a lifetime warranty for stain, soil, pet urine resistance, and anti-static. It also has a 10-year warranty against abrasive wear, texture retention, fade-resistance and manufacturer’s defects. Check with your representative from American Carpet Wholesalers if you have more questions. Caring for the Mohawk Artfully Done carpet tile is relatively easy. Once a week Mrs. Dixon cleans the carpet with a good vacuum meant for premium soft carpet like Mohawk Artfully Done. It is recommended that once a year she should consider having the carpet professionally cleaned. If for some reason she gets any snags she should simply use scissors to clip them. Pulling on them is not recommended as that could cause permanent damage. Today, indoor air quality (IAQ) is an important environmental consideration, especially since we spend approximately 90 percent of our time indoors. Mohawk Artfully Done carpet tile has used the Green Label program to test its carpet to help ensure it identifies as a product with very low emissions of Volatile Organic Compounds (VOCs). The CRI launched the Green Label Plus programs for carpet, adhesives and cushion. These enhanced programs set higher standards for IAQ and ensure that customers are purchasing the very lowest emitting products on the market. The Green Label Plus program symbolizes the carpet industry’s commitment to a better environment for living, working, learning and healing. So like Jamie Dixon of Duluth, give the flooring experts at American Carpet Wholesalers of Georgia a call today if you are thinking of a new floor for your home or office. Not only do they have decades of experience but when you call, they can really help you where it matters – time and money! Internet pricing and shopping is a great thing but when you back that up with a real carpet industry staff, you get the advantage of the best knowledge and the best up-to-date pricing. Do yourself a favor and call ACWG today at (800)548-2706 and ask them about Mohawk Artfully Done carpet tile. Click here for more reviews of the Carpet Tile products available at American Carpet Wholesalersor Click here to explore other styles of flooring.